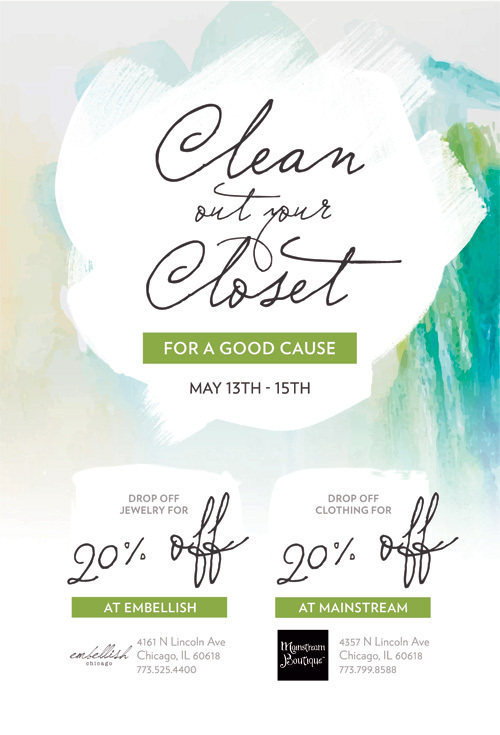 Two Northcenter shops, embellish chicago and Mainstream Boutique, are partnering for the second time to collect clothes and accessories to benefit the women of Sarah's Circle. From Friday, May 13th thru Sunday, May 15th, you are invited to "Clean Out Your Closet" and drop off donations at the two shops (both on Lincoln Avenue). There's something in it for you, as donor -- 20% off merchandise at both shops (see the graphic to the right). They are seeking donations of gently used or new women's clothing and accessories. The first time the two boutiques partnered, they were able to bring several carloads full of donated goods to Sarah's Circle, which serves women who are homeless or in need of a safe place. For the past 37 years, Sarah's Circle has offered emergency housing, clinical services, job training, counseling, and much more, to more than 900 women each year. Mainstream Boutique is located at 4357 North Lincoln. It's open Friday and Saturday 10-8, and Sunday 12-5.